Living life takes courage. Period. It just does. And I see examples of courage everyday. I see them at home, at work, in the community. And a few nights a week in the Spring? I see them on the baseball field. When the bases are loaded, your team is down by one in a game between rivals that has been anticipated for months, and it’s the last inning? Yep, it takes courage to stand at bat and swing for the fences. But in baseball, you know that’s all part of it. Someone has to be the last man out. Last night as we were at a high school baseball game between two talented county team rivals, our team had it’s last turn to bat. We were down by one. It was a high scoring game…11 to 12. 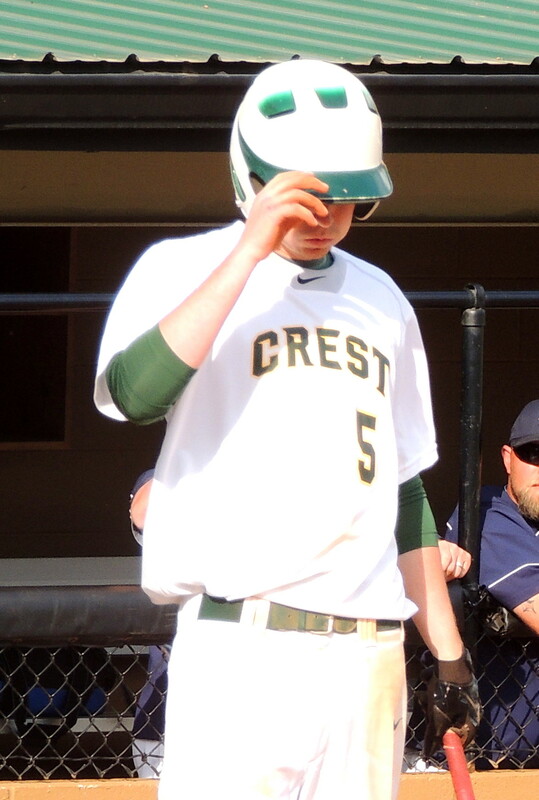 There were two outs, 2 runners on base, and ….my son ……………wasn’t up. Phew! Relief. But….he was up next. (Yikes. Prayers flying heavenward…) So if this batter got a hit and made it to the base, it would’ve been the scenario of : team down by one run, 2 outs, bases loaded, last inning, high stakes game, and my son up. And in that moment, he’d have the chance to be a hero, or the last man out. And here’s another self-revelation. I think it’s a whole heck of a lot easier for me to have courage for myself than to watch and endure my kids having to stand in the gap. It’s so much easier for me to risk and fail, to be ostracized or ridiculed, to be rejected or hurt, than to watch my kids endure the pain and loss that comes with risk, the hurts and aches and growing pains that come with courage. It starts when they’re young. It’s tough to not reach out and rescue that stumbling toddler to keep him from falling as he learns to walk. But sometimes what parents may see as ‘helping’ can be providing crutches that only make the growth process harder. As we grow up with our kids, the arena of what we want to guard or ‘rescue’ our children from changes. But, cushioning those we love from pain can often be a deterrent to their growth, to their success, to their development of courage. As a mom, that’s one of the lessons I’ve felt is so incredibly important. To help our kids know that it is so very okay to fail. Courage means picking yourself up, dusting yourself off, and trying again. (and again, and again, and again). Courage also means not rescuing those we love from situations that demand courage. That’s the tough part as a parent, but also an incredibly crucial step in the development of courage. One of my all-time favorite quotes is “Where courage is not, no other virtue survives except by accident”, (Sam Johnson). Developing courage begins in the little steps of learning to take a step even though we may fall, literally and figuratively. It continues as we encourage our kids to use their voices, their gifts, their talents even though they may not be appreciated. It continues as we encourage them to not place their identity in failures faced, but in the way they face them. It continues as we as parents allow them to risk and stand in the gap and wholeheartedly support their desire to swing for the fences when it may mean risking them being the last man out. It takes courage to encourage courage in our children. And for me? It takes faith in a God who has a purpose and a plan for us all. For my children as much as for me. Tapping into that Truth not only comforts and encourages, but inspires confidence that allows me to risk and fall and rise and keep trying. Faith and courage go hand in hand. So, here’s to standing up for what we believe in. Here’s to living life out loud with the voice that you’ve been given. We have one life to live, and it’s a gift not just for us, but for those around us. And here’s to encouraging our kids to do the same, no matter how hard it is to watch. So here’s to being willing to swing for the fences when the bases are loaded and there are two outs. If we are destined to be the last man out, so be it. But, then again, we just never know when we might bring in the winning run that’s a game changer for us all. We’ll never know until we try. P.S. One more thing…. Babe Ruth? He’s known as one of the all-time best in baseball. And he struck out 1,330 times. That’s a lot of standing in the gap, swinging for the fences, and missing! He even held the Major League record for 30 years until Mickey Mantle surpassed it in 1964. But homeruns? He had 714 homeruns. So one of the greatest hitters of all time had almost twice as many strike outs as homeruns. Am guessing that the two go hand in hand. The success, the failures? Yes, they go hand in hand. Maybe the thing which holds them together like glue is the courage to rise from failure and stand in success and be willing to do it all over again, knowing that ultimately these are not what define us. Success doesn’t define. Failure doesn’t define. How we face them both, with or without courage? That shapes and defines and impacts our world, not just for us, but for those in our world, on our team, who are watching to see our next “swing”. Oh my goodness! I love this! So relevant to all of us. Thank you for sharing! So glad I’m not the only wimpy mom out here. Thanks so much for stopping by!